Louette	M, Meirte	D, Louage	A, Reygel	A. 2010. Type specimens of birds in the Royal Museum for Central Africa, Tervuren. Revised Edition. Zoological Documentation Online Series (R. Mus. Centr. Afr. ), 332 pp..
Abstract. The 988 bird type specimens (excluding 'topotypes') preserved in the Royal Museum for Central Africa are listed. They represent a total of 227 nominal bird taxa. At least 103 are present-day valid names of species or subspecies, and the remainder are synonyms or require confirmation. 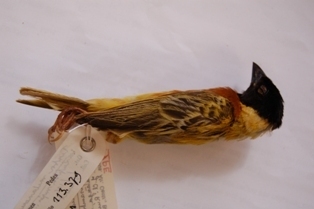 Other RMCA specimens, at some time erroneously considered as types, are listed separately. We also list the registration numbers (in other museums) and the data of the name-bearing specimens of all the taxa represented by type material in the RMCA. The RMCA collection originates exclusively from Africa. It holds taxa with types from Democratic Republic of Congo (110), Kenya (72), Uganda (30), Somalia (8), Rwanda (6), Zambia (3), Comoros (2), Ethiopia (2), Tanzania (2), Angola (1), Liberia (1), SÃ£o TomÃ© & PrincipÃ© (1), Zimbabwe (1). Obviously, the material from the former Belgian colonies is even nowadays of great importance. The East African material is of mainly historical value: it consists mainly of types collected by V. G. L. van Someren (other parts of this collection are in the AMNH, New York and the FMNH, Chicago) and some types collected by H. Granvik. This is an electronic update of the printed Type specimens of birds in the Royal Museum for Central Africa, Tervuren (Louette, Meirte, Louage & Reygel, 2002). A short biography of the describers of bird taxa in the RMCA is provided. This paper was previously published in 2002 by the RMCA, in the series â€œZoological Documentationâ€�, vol. 26. The newer online version is similar to the printed version, but with slight corrections; also each taxon starts on a new page. The introduction has a brief history of the collection and a short biography. See also details of these weavers here.